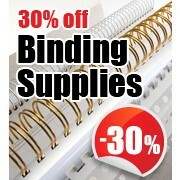 Binding Store offer a full range of Business Card Cutters and Slitters, these range from entry level card cutters up to automatic equipment. For expert advice call the UKs No1 suppliers. 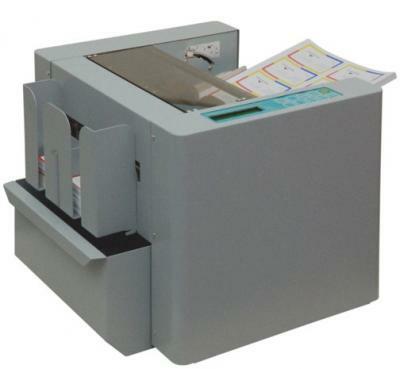 The Uchida BC-10 A4 Desktop Business Card Cutter is the best selling machine of its kind on the market. 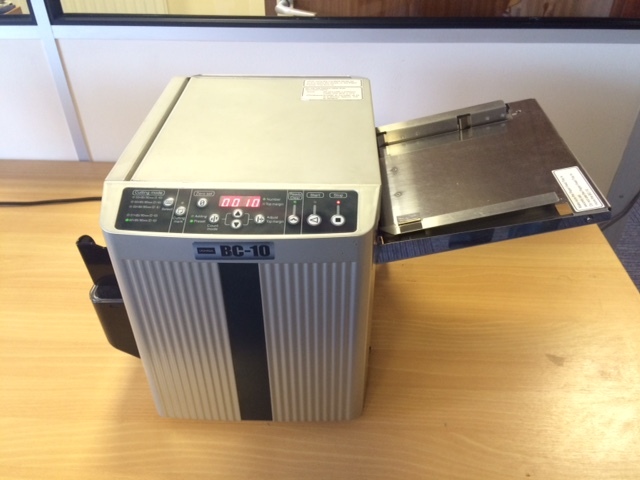 With an RRP of £3295+VAT this used machine is an affordable and ideal solution for people looking to start producing business cards. These machines were received back after being under contract at a major UK stationery store. Its a doddle to use! High performance, quick set up, desktop SRA4 business card cutter that will do up to 130 cards a minute! Ideal for printers or copy shops looking to get in to the business card market! The Cyklos CS 325 Smart Card Slitter is a highly robust and durable card cutter that allows the fast and accurate production of business cards. 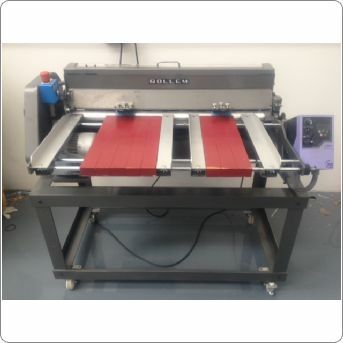 This machine uses interchangeable slitting tools that makes job sizes versatile. Both longitudinal and latitudinal cuts can be made without removing the tools or adjusting the distances between knives. There are 4 different types of tools available with the CS 325 Smart including atypical tooling for obscure custom dimensions. The feed system has navigation bars enabling curled paper to feed. It has a feed sensor to allow automatic start of cutting operation. Paper stocks of up to 400gsm will work on this business card cutter. It has two independent feed tables for faster processing. 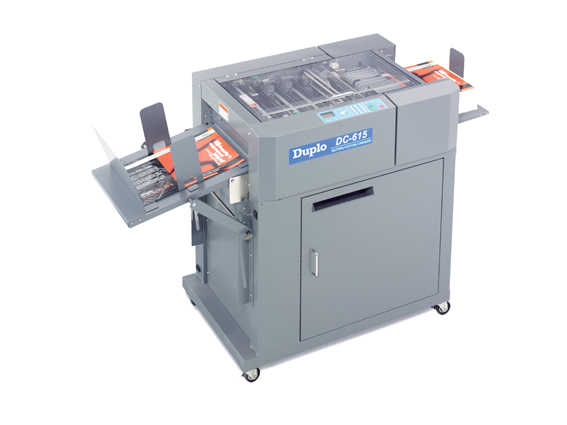 The Cyklos C-Press 440 Die cutting Press is a simple, electric machine that will produce cut outs such as business cards, jigsaws and other die cut shapes. This die cutter utilises standard die cutting forms which pass through adjustable pressure rollers. 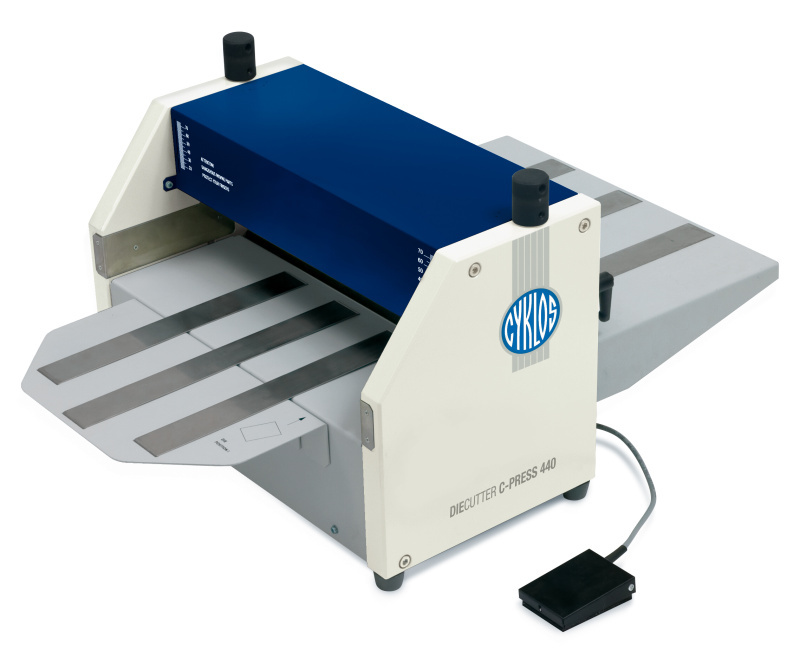 The C-Press 440 has a maximum cutting thickness of 2mm including plastics and card. It has a working height of 20-72mm which is continuously adjustable. The DC-615 Slitter/Cutter/Creaser performs exactly as it states: accurate creasing, slitting or cutting of digitally printed work. It is an ideal answer to the question of how best to finish many types of short run digital print which can result in cracking problems when using standard finishing machinery. The single unit offers a multiple of finishing options to create a myriad of professionally finished saleable products in a single pass. Duplo’s understanding of the problems associated with digitally printed material has led to the inclusion of features to keep the unit operating to its full potential. Despite this versatility, the DC-615 is simple to operate thanks to touch-panel displays and well-conceived user interface. 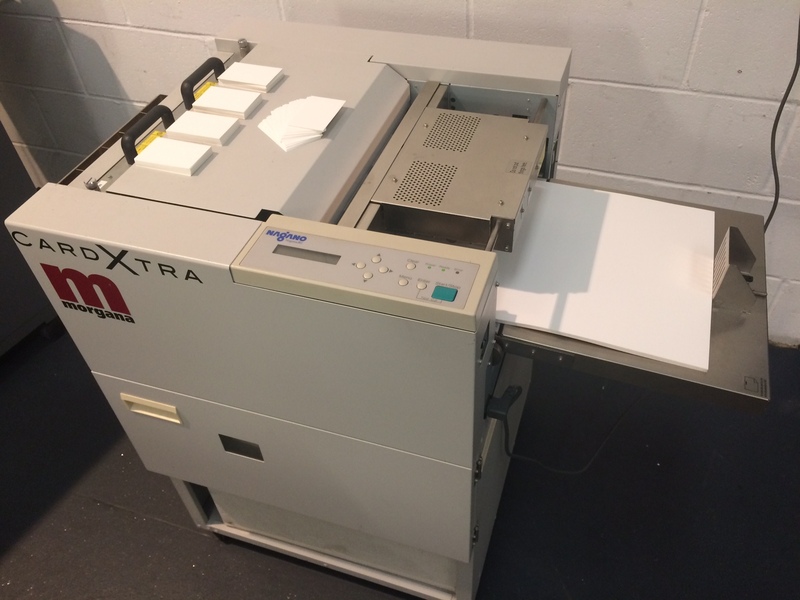 The machine is ideal for cutting business cards from 20 up on SRA3, as well as greeting cards, brochures and flyers. Used Morgana CardXtra now in stock. Complete with New MC-1 cartridge. Cuts documents quickly and accurately up to SRA3 formats. Low cost, efficient multifunctional finishing machine ideal for digital and litho printers. The ultimate SRA3+ Business card & Document AutoCutter that anyone can use to simplify cutting tasks and achieve higher productivity. Fast, versatile and and very easy to use, the suction feed CardXtra is ideal for the on-demand environment and features the ability to take A3 plus sheets in weights upto 325gsm. 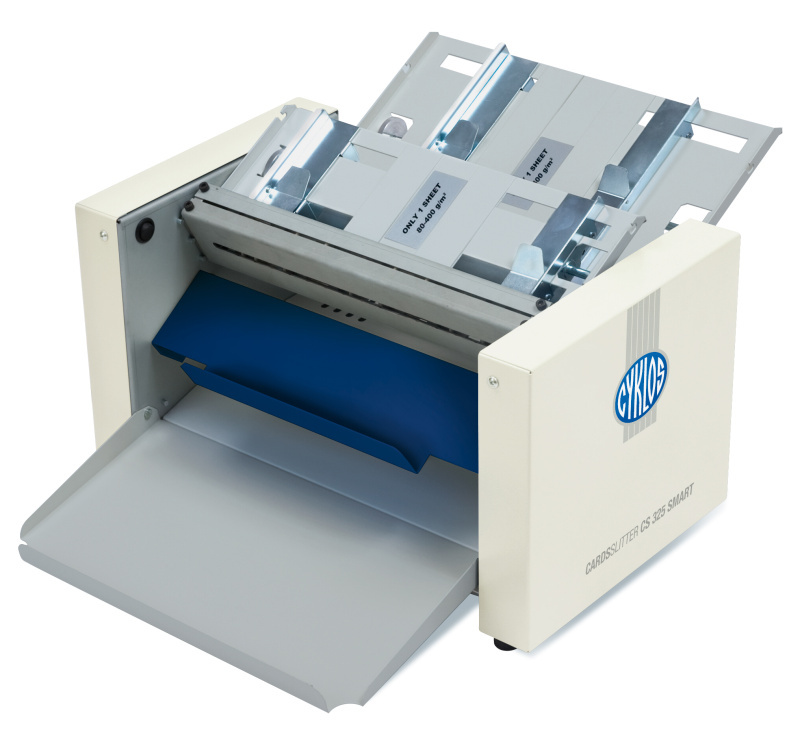 It produces 140 business cards a minute (7 x 20 up sheets) and can also be used for postcards and other formats. It allows extremely fast set-up and has quick-change rotary blades. It has pre-select programmes for different cutters as well as pre-programmable memory for storing common jobs. A recognition sensor allows the Cardxtra to follow the printed image. This is achievable by printing a special mark on the sheet, the size and position of which are available on the downloadable templates. Engineered to accept SRA3+ paper and card (320 x 469.5mm) and accurately cut small, medium and high volumes of paper and card while allowing the operator to get on with other tasks.